Navigational Rules for Kayaking - what does this mean? If you are paddling in a location where motorized boats share the water, you should know the rules. Because you are in a paddle craft, it does not mean that you have the right of way. The Navigation Rules do not give any vessel the right of way. Instead - the circumstances determine who has the right of way. Please take some time are review these helpful boating videos so you know how to control your boat and boat safety on open water. One of the most important parts of boating safety is to use your common sense. This means operating at a safe speed at all times, especially in crowded areas. Be alert at all times, and steer clear of large vessels and watercraft that can be restricted in their ability to stop or turn. Also be respectful of buoys. Did you know that the majority of drowning victims are the result of boating accidents were found not to be wearing a Life jacket? Make sure that your family and friends aren’t part of this statistic by assigning and fitting each member of your on board team with a life jacket prior to departure. Unlike the roads and highways that we drive on, the waterways we go boating on do not have road signs that tell us our location, the route or distance to a destination, or of hazards along the way. Instead, the waterways have Aids To Navigation (or ATONs), which are all of those man-made objects used by mariners to determine position or a safe course. These marks are also indicated on your chart. 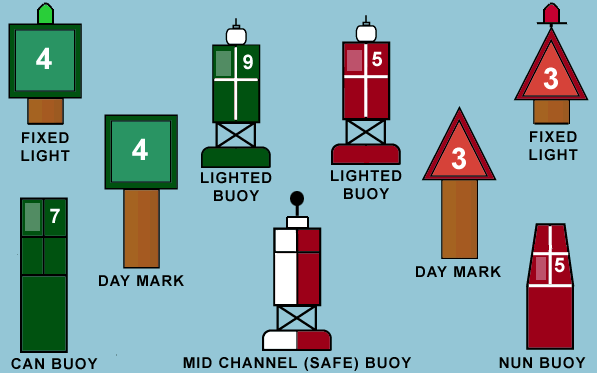 The term "aids to navigation" includes buoys, day beacons, lights, lightships, lighthouses, radio beacons, fog signals, marks and other devices used to provide "street" signs on the water. Aids to navigation include all the visible, audible and electronic symbols that are established by government and private authorities for piloting purposes. To help you understand what these mean, the basics are presented here. 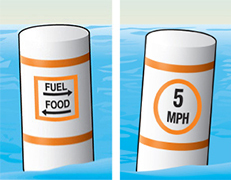 Port-Side Buoys have a cylindrical above-water appearance, like a can or drum floating on its axis. Commonly referred to as "CAN" buoys. Beacons - Port side beacons have square marks attached to them, with two shades of color and a reflective border. Starboard aids are red in color, evenly numbered, and will be on your right side as you travel upstream. 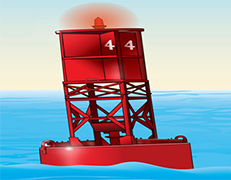 Buoy numbers increase as you head upstream, and may have a red light. 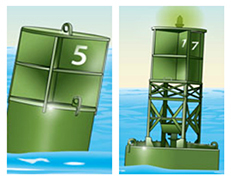 Starboard-side Buoys have an above-water appearance like that of a cylinder topped with a cone, pointed end up. The cone may come to a point or be slightly rounded and are commonly referred to as "NUN" buoys. Starboard-side Beacons have triangular marks attached to them, with two shades of color and a reflective border.